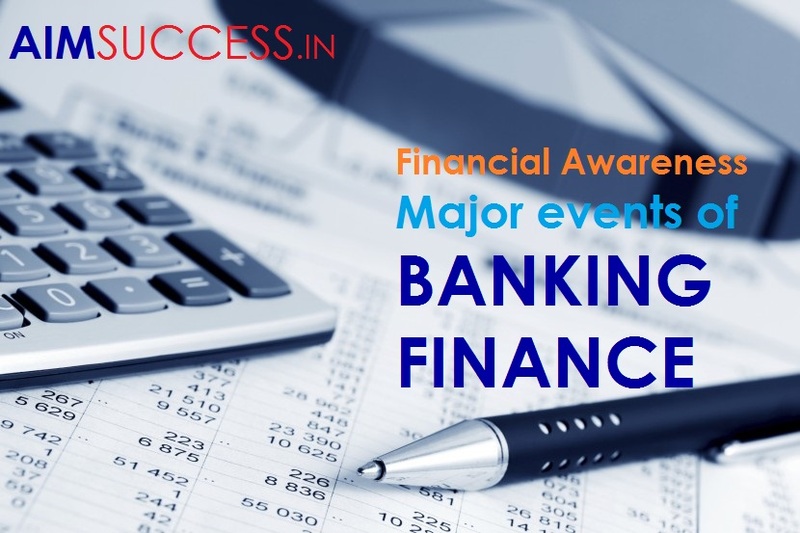 Today we are sharing some major events of banking & finance sector that took place recently. Banking & financial awareness is a Major Segment of all the Banking & Insurance examination. To make you well aware with the important banking & finance we have started our series 'Quick look on financial Awareness'. Here is the next part of the series to keep you well updated with all the important banking & financial sector news. India has ranked 60th in Global Innovation Index (GII) in 2017 in a survey of innovative capacity among 127 countries. This index was released by Cornell University, INSEAD and the World Intellectual Property Organization (WIPO) released on Thursday. Switzerland topped the list following by Netherlands and U.K. According to a report launched by United Nations, India is A top- remittance receiving country of 2016. The title of UN Report was 'Sending Money Home : Contributing to SDG(Sustainable development Goals ) , One family at a time. India received 62.7 USD in 2016 by the Indians working across World. India has ranked 75th in Environment impact survey. This survey was conducted by UK based Money Market. Mozambique has topped this survey. Government has made Aadhaar mandatory for opening new accounts. It has noted that all existing bank accounts will have to be linked with Aadhaar number by December 31,201 or else they will be declared invalid. Aadhaar has been mandatory for opening new accounts for as well as for carrying out high-value transactions. The government has said that transactions worth Rs 50,000 or more will now require Aadhaar number. PAN number was required for high-value transactions. But now instead of PAN, consumers will have to quote Aaadhar number. The deadline for linking bank accounts to Aadhaar number is the end of the year, it is not yet clear since when quoting Aadhaar for transactions will become mandatory. The last date for linking bank accounts to Aadhaar number is 31st December , 2017 . But it is not yet clear since when quoting Aadhaar for transactions will become mandatory. Earlier Supreme Court made a decision that Aadhar Linkage with PAN card is mandatory for filing income tax returns. CSO has changed the base of Index of Industrial Population ( IIP) to 2011-12 from 2004-05. Central Statistics Minister is Mr. D V Sadananda Gowda . The Reserve Banks of India (RBI) announced introduction of new Rs 500 currency notes on 13th June. The new version will have few different aspects. The one noticeable aspect of the new currency notes is the inclusion of an inset letter "A". Also, in the new notes the signature of the RBI Governor will be on the reverse side. The notes will also bear Swacch Bharat logo on the backside of the note. The old notes of 500 , which were introduced after the Demonetization move will continue to be legal tender. DCB Bank, private sector bank has launched new services - India’s first Aadhaar based iris eye scan customer verification and fingerprint operated ATM in Telangana. This service has been inaugurated in Manchareial , Mothe and Narsapur branches of Telengana. DCB bank has its Hedquarter in Mubai. The chairman of the bank is Nasser Ranje. The M.D and CEO of bank is Mr. Murali M. Natrajan. IDBI Bank is the only public sector bank that got ‘high (H)’(85 and above score out of 100) rating in two successive surveys of 2015 and 2017, According to the Code Compliance Rating of banks done by the Banking Codes and Standards Board of India (BCSBI) 2017. A total of 51 banks (46 banks in 2015) were surveyed for code compliance in 2017. The code compliance rating is based on five parameters — information dissemination, transparency, grievance redressal, customer-centricity, and customer feedback. This rating is considered an indicator of the level of implementation of important code provisions at the grassroot level of a bank. The eight private sector banks that got ‘high’ rating are — Axis Bank, DCB Bank, HDFC Bank, ICICI Bank, IndusInd Bank, Kotak Mahindra Bank, RBL Bank and YES Bank. The three foreign banks — Citibank, HSBC and Standard Chartered Bank — that were surveyed got ‘high’ ranking. Headquarter of IDBI is in Mumbai and it is headed by Mr. Mahesh Kumar Jain. The Reserve Bank of India (RBI) has placed Central Bank of India under prompt corrective action(PCA) after viewing the negative return of assets as well as the high ratio of Bad loans. When a Bank is Under PCA by RBI, It puts restrictions on banking activities of the Bank such as lending money, loans, hiring staff, and expansion of Bank branches. Central Bank has reported a loss of Rs. 2439 Crore for the fiscal year 2016-17. Till now, RBI has placed four banks under PCA, which are IDBI Bank , UCO Bank, Dena Bank and Indian Overseas Bank. Tata Consultancy Services (TCS) has announced the launch of the BaNCS app development kit that will enable banks to fast design and build their own apps and deploy it across devices and desktops seamlessly. "BaNCS ADK" will help banks to design and deploy both enterprise and consumer apps in a hybrid architecture, adopting modern principles of responsive web design with the vision to increase flexibility and developments of Banks. Securities and Exchange Board of India (Sebi) has approved the National Stock Exchange’s (NSE’s) proposal to appoint Vikram Limaye as the managing director and chief executive officer (MD & CEO) of National Stock Exchange. But this is on condition that he resign from the Supreme Court-appointed Committee of Administrators (CoA) to oversee the Board of Control for Cricket in India. NSE has its headquarter in Mumbai. A meeting of Foreign Ministers of BRICS Countries held in Beijing, China on 18th And 19th June 2017. V.K. Singh, Minister of state for external affairs attended this meeting from India, as External Minister Sushma Swaraj had to cancel this due to her health issues. The meeting was chaired by Foreign Minister of China Wang- yi. BRICS countries include: Brazil, Russia, India, China and South Africa. Commerce Secretary Rita Teaotia announced that India has emerged as a 7th largest exporter of agri-products globally. Addressing the 22nd APEDA Export award function in New Delhi, she said there is a significant increase in the exports of food products from the country and it represents more than 12 percent of total exports. Agricultural and Processed Food Products Export Development Authority popularly known as APEDA is an apex body of the Ministry of Commerce, to promote the export of agricultural commodities and processed food products. APEDA links Indian exporters to global markets besides providing comprehensive export-oriented services. APEDA provides referral services and suggests suitable partners for joint ventures. Senior bureaucrat Kajal Singh was today appointed as Executive Vice President (Services) in Goods and Services Tax Network (GSTN). Canara Bank has inked pact with the state-owned general insurer The New India Assurance Co to sell policies through its branches. This tie-up will make available general insurance products from over 6,000 Canara Bank branches in the country. The tie-up will offer personal products such as motor insurance, home insurance, health insurance, travel insurance besides commercial policy coverages like fire insurance, marine insurance and engineering insurance. The headquarter of Canara Bank is in Bengaluru. Mr. Rakesh Sharma is M.D. and CEO of Canara Bank. IDBI Federal Life Insurance announced its partnership with SunTec for GST roll out. The pupose is to facilitate in computing and invoicing of debit tax and credit tax that will be GST compliant. The headquarter of IDBI is in Mumbai. Mr. Mahesh Kumar Jain is MD & CEO of IDBI. Yes Bank has partnered with mobile payments switch TerraPay to enable real time money transfer to bank accounts in India. Powered by TerraPay’s global clearing and settlement service, the partnership will make it faster and convenient for consumers to send money to any bank account. This tie up enables TerraPay’s network partners to make instant cross-border money transfer to bank accounts in India. This means that Indian migrants worldwide can walk into TerraPay’s partner outlet anytime and send money to their family and friends back home, instantly in their bank account. The headquarter of Yes bank is in Mumbai which is headed by Mr. Rana Kapoor. The two MoUs which are signed with StateBank of India are : SBI ePay and SBI CMP facilities. Meghalaya government has already established a new treasury called as Cyber Treasury, which dedicatedly handles all online transactions of government receipts across the state centrally for a few selected departments, he said. With the implementation of the Goods and Services Tax(GST), these MoUs are expected to give dealers and other citizens the desired platform for conducting financial transactions with the state government on a digital platform. In partnership with YES Bank , Hike messanger launched an in-app wallet that will enable its 100 million users to make payments transfer through the app. It has Unified Payments Interface support which allows Hike users to do free and instant bank-to-bank transfers with their friends.For those who don’t actively use a bank account, Hike still allows them to send and receive money with your friends through the Wallet. Hike is the first messaging platform in India , which has launched payment facility.